The NEC UM351W and UM361X can project onto a tabletop for collaborative work. 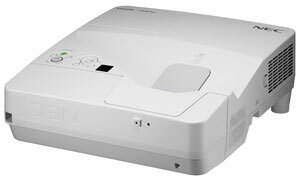 NEC Display Solutions of America has announced two ultra-short-throw projectors designed for collaboration. The UM351W and UM361X are capable of tabletop projection, so images can be projected onto a table or other horizontal surface for group work. In addition, the projectors can be paired with NEC's new NP03Wi auto-calibration interactive whiteboard kit, which supports up to 256 wireless pens for annotation (the kit includes two pens and is available separately or bundled with the projectors). And the company's DisplayNote software enables collaboration between a mobile device and the interactive surface. ECO Mode technology to extend lamp life and lower power consumption.